Best Western Sweetgrass Inn 1540 Savannah Hwy. Charleston Riverview Hotel 170 Lockwood Blvd. Days Inn Historic District 155 Meeting St.
Embassy Suites Historic District 337 Meeting St.
Hampton Inn Historic District 345 Meeting St.
King Charles Inn Historic District 237 Meeting St.
Great Beach Center/Two Beachwalker Dr. The Charleston area offers a wide range of lodging choices from world class resorts, to numerous hotels. Rental companies also offer beach houses, villas, and condos. We've provided a listing with contact information in the left margin of this page. The acknowledged big three golf resorts in the Charleston area are Kiawah Island, Wild Dunes and Seabrook Island. All three are full service resorts with multiple golf courses. All three of these resorts are ranked 4 stars or better by Golf Digest, with Kiawah's famed Ocean Course leading the way with 5 stars. Kiawah was responsible for bringing quite a bit of publicity to the area by hosting the thrilling 1991 Ryder Cup Matches on the awesome Ocean Course. 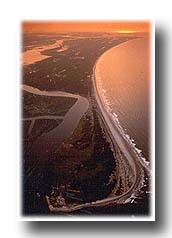 Kiawah also has Osprey Point, Turtle Point, and Cougar Point. Your accommodations choices at Kiawah Island Resort are outstanding. Your quarters on this island may be a lavish, private oceanfront home with private dock, miles of deck, and room for everyone. It may be a handsomely appointed villa mere steps from the first tee. A villa with breeze-kissed balconies from which the sounds of the sea provide a sensuous nightly serenade. Or perhaps a luxurious room or suite at The Sanctuary at Kiawah Island, the finest oceanfront hotel built on the East Coast in two decades. Seabrook Island Resort combines the exclusivity of a private club with the full services of a premier oceanside resort. Seabrook's two championship courses, Crooked Oaks and Ocean Winds are only available to resort guests. There are few places where the world rarely intrudes. You have just found one of them. Edged by wide, uncrowded beaches and pristine dunes along the South Carolina coast, Seabrook is an unspoiled island paradise with a variety of accommodations from oceanfront homes to golf course villas. There's something perfect for your group at Seabrook Island. Wild Dunes is located on the beautiful Isle of Palms and boasts two terrific courses. The award-winning Links Course was designed by Tom Fazio and features spectacular finishing holes on the Atlantic Ocean. The Harbor Course, also designed by Fazio plays along the Intracoastal Waterway. 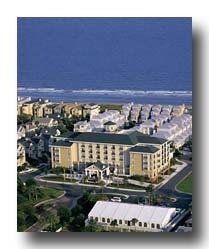 The accommodations at Wild Dunes features luxury and spectacular views. The luxurious details of a retreat with all the comforts of home and much, much more. Find everything for an unforgettable vacation at all Wild Dunes' extraordinary accommodations. To create memories you'll want to revisit. The AAA Four Diamond-rated Boardwalk Inn showcases the best of Wild Dunes. And the Boardwalk Homes sit along the ocean front pools and pristine beaches. Plus, stays at all of the 350 luxurious homes and condominiums include exclusive access to amenities and services resort-wide. In addition to the world-class full resort accommodations mentioned above, there are many other opportunities to stay in local hotels and inns to satisfy almost any budget you have. In Mt. Pleasant, your are close to many of the golf courses in the area and have ample lodging choices. One worth mentioning is the beautiful Hilton Charleston Harbor Resort and Marina. This hotel is located on Charleston Harbor and features great views of the historic area. It's also just down the street from Patriot's Point Golf Course. Another popular option for lodging is at the Quality Inn & Suites in Mt. Pleasant, offering great values on golf packages at Dunes West and RiverTowne.